For my final instalment with a horror theme for this year, I find it quite poignant that my journey ends not only with the Bram Stoker Festival but also with an insight into another’s adventure, in search of the elusive character that many believe was the basis for Bram Stokers Count Dracula. It all stated some weeks ago after writing an article on Bram Stoker for this blog. I was contacted by a fellow Photographer/Blogger Columbia Hillen. 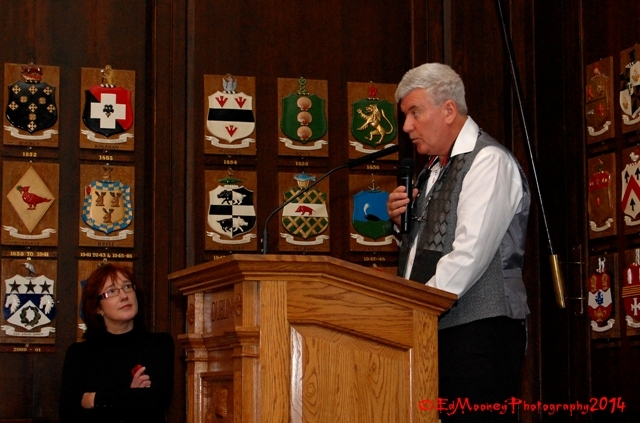 To cut a long story short I was kindly invited to attend a lecture given by her Husband John in the Mansion House. Born in Belfast, Northern Ireland John Sean Hillen is a seasoned journalist & editor with more than 30 years’ experience, working for various media organisations. During the course of his career he has covered many of the world’s hotspots, from the Troubles of Northern Ireland to the final days of the communist regime in Romania and the Gulf War. John has also been a correspondent in the fields of medicine, science and archaeology. Today John lives with his Transylvanian-born wife, Columbia in rural Gweedore, Co. Donegal, Ireland. 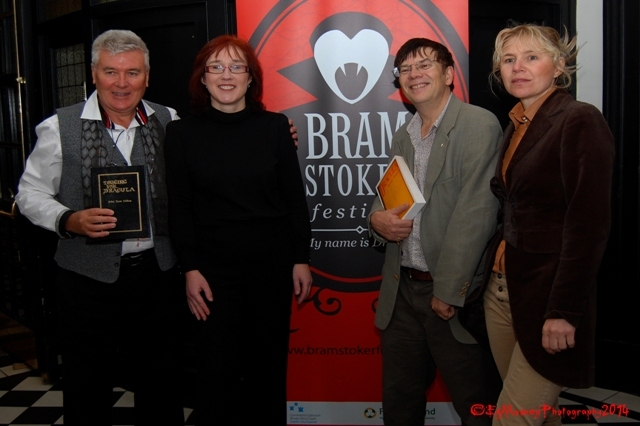 (l to r) John Sean Hillen, (author of Digging for Dracula) Vanessa Fox O’Loughlin (founder of the Inkwell Group and organiser of the festival’s literary programme) Professor Bill Hughes, (Bath Spa University) and Angela Dinu, (a genuine Transylvanian from Brasov). 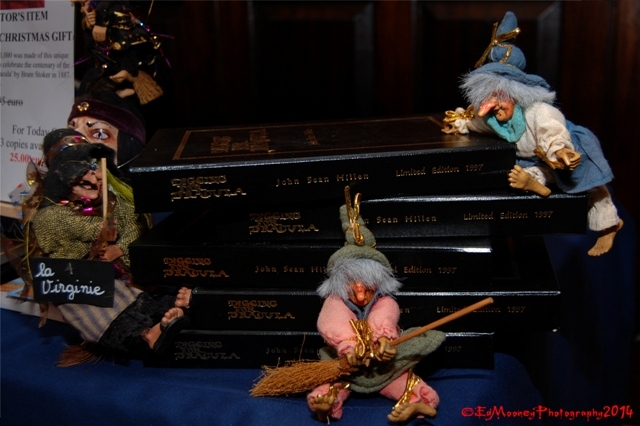 The lecture included an authoritive narrative from John with some visual aids, spanning an adventure which took him across Europe and America in search of the truth behind Dracula. Without giving to much away, John explored the historical facts and literary fiction associated with the three main points of interest, Bram Stoker, Count Dracula and the Voivode of Wallachia, Vlad Tepes. And just for good measure John introduced the captive audience to some tasty titbits all with their own unique association to the Vampire theme, and which John had come across during the course of researching the book. From the mummified remains of Templar knights in Dublin, to Jeanne Youngson, a Vampire expert and proud owner of the world’s only Dracula Museum. Then there was the Stinking Rose’s, America’s most successful garlic festival, and New Orleans with a host of supernatural secrets and the Vampire Queen herself, Ann Rice. At the end of the lecture, the floor was opened up for questions. One of which brought a smile to my face when a member of the audience asked John whether he actually believed that Vampires existed? John quickly answered with a quote that I abide by on my own adventures. “Just because something is written about doesn’t mean it’s true. But then again, just because we don’t see something doesn’t mean it’s not.” Digging for Dracula is a cleverly written piece of work, packed with fascinating information and little known revelations. I would highly recommend that anyone with an interest in the subject should read it. 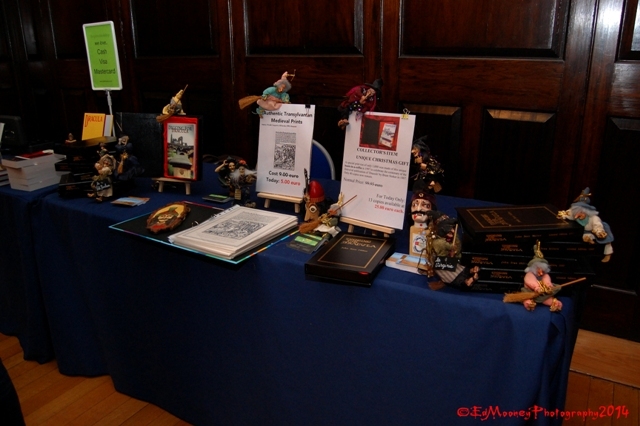 You can find out more about John by visiting his Website and Blog. 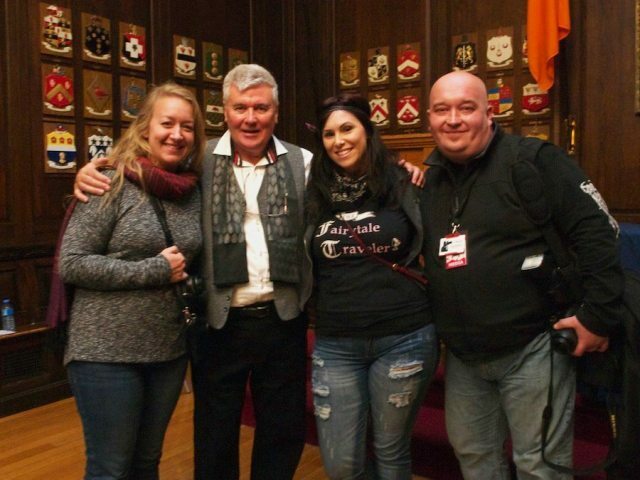 (l to r)Katie Lutz, John Hillen, Christa Thompson & Me on the opposite side of the camera for a change. Image courtesy of Columbia Hillen. 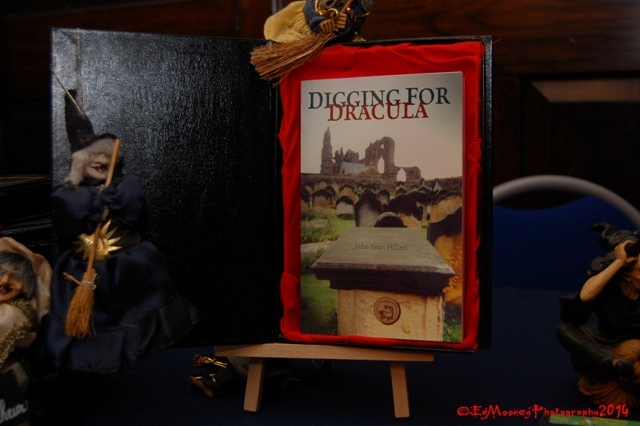 This entry was posted in Legends, Photography and tagged Bram Stoker Festival, Digging for Dracula, Dracula, Dublin, Ireland, John Sean Hillen, mansion house, Nikon, photographer, Photography, Travel, Vampire. Bookmark the permalink. Fascinating stuff, Ed. You’ve made me want to read the book. Very interesting Ed, and a fitting finale to your series, which I have enjoyed immensely! Thanks Ali, Now for the dreaded C word. Guess where Santa is buried? Interesting lecture notes – I guess the author has to stay on the fence regarding the belief in vampires as to not alienate his potential audience. Glad you had a fun time – thanks for bringing us along. Interesting information Ed. I’m glad that you enjoyed the lecture and took some time to share it with us. The book sounds like something I will have to check out. Great stuff!! I’m going to check out his site too!! Thanks Ed!! Cool! I wish I could’ve gone to the talk – I really enjoyed reading Dracula and the way you described it makes the lecture sound fascinating (I’m not saying that it wasn’t actually fascinating, just that it sounds really cool haha.) Nice post. Met this passionate and talented photographer recently in Dublin and I am glad to share one of his posts. Wow.. I want to get my hands on this book!